Solinco are more famous for their strings than their tennis racquets, but that does not mean the racquets are bad. I was actually positively surprised by this Solinco Shadow 305 Racquet Review. The only issue is that it does not stand out enough in the competitive tennis racquet marketplace. I have been a fan of Solinco strings ever since they released the Solinco Tour Bite and I am now a regular user of the Solinco Hyper-G . 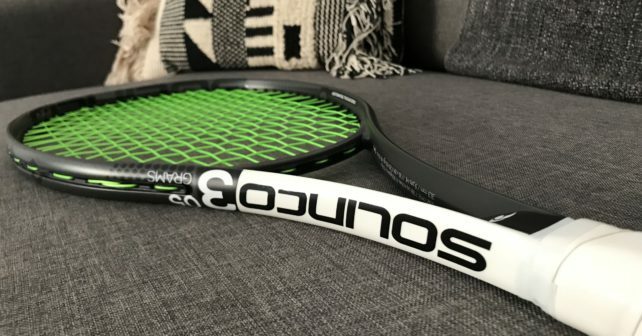 I have never tried one of their racquets before so that is why I was happy to do this Solinco Shadow 305 racquet review. The Solinco Shadow 305 is only one of Solinco’s racquets. They also have a Pro (18×20) and a Tour (16×19) series, but the only racquet head sizes they produce are 98 and 100 sq inch racquets. You can check out their selection on the official Solinco website. This is quite similar to many racquets of today such as the Angell K7 Red, the Blade 98 16×19 , the Tecnifibre Tfight XTC 305 , Yonex Ezone 98 and so on. What is it that makes the Solinco Shadow 305 different? performance material, Liquid Crystal Polymer (“Liquid Crystal Technology”), which provides for exceptional strength (5x’s stronger than steel), vibration dampening characteristics, and resistance to abrasion.” I must say the feel of this racquet is rather “raw” however, it is not overly dampened or too harsh, but if you hit outside the sweet spot, the feel can be a bit brassy. I did find the string pattern quite balanced. Some 16×19 racquets give you too much launch angle, but the Shadow 305 is open but not too open. Don’t expect crazy amounts of spin though. This racquet could be suitable for both flatter and “spinnier” hitters. The power level wasn’t very high, sort of similar to the Angell K7 Red. You definitely need to provide your own power. I thought it played better with some lead tape at 3 and 9 to increase stability and plow-through. Four grams is my usual medicine and it worked well also on this stick. The Solinco Shadow 305 does most things well, but nothing spectacularly. There wasn’t really one shot I could fault it on, but it does not deliver exceptionally well anywhere either. The feel is decent too, but it is not plush and not crisp. It kind of falls in the middle in every department. Solinco Shadow 305 Racquet Review – Who is it for? The Solinco Shadow 305 is a decent performer on all shots but does not really give you anything to shout about from the rooftops. It is a balanced and good racquet, but it is not that easy for me to find a player style/player that will benefit most from playing with the Solinco Shadow 305. It did okay on pretty much every shot, it wasn’t too powerful, not too low-powered, it did not give too much spin, but it provided some. It might sound like the best racquet of all time in the way that nothing is too much with this stick, but there was not really anything special about it either. I think it is a good racquet for all-round players that want something that plays fine from all areas of the court. The sweet spot is decent, especially with some lead tape at 3 and 9. My friend thought it was a bit sluggish with the lead (he uses an uncustomized Pure Strike 2017) so that setup might not work for everyone, but I did feel it needed some extra weight to limit the slight brassiness on off-center shots. To summarize: the Solinco Shadow 305 is a decent racquet for the all-courter. No big flaws here, but nothing wow either. It might be a perfect fit for you, but I left the court looking for more (of something). What do you think of Solinco racquets? Have you tried one? Let me know in the comments below! Nice review as always. Since you have reviewed a non traditional brand racquet, I wanted to request you to review another not so famous brand – Decathlon’s Artengo racquets. I have heard good things about these racquets and would love to know how you feel about the top line Artengo racquet.